In Playground Play, Licketyspit empowers children and young people to lead play for themselves, their peers and younger pupils. Licketyspit Actor-Pedagogues teach children how to play the 40+ activities in the Lickety Playcards – illustrated descriptions of the games, rhymes, songs and imaginary play activities in the Lickety Play repertoire. In Playground Play we help older children set up games to play independently at break and lunchtime. We also talk about how we play and why we play the way we do – with fairness and inclusivity at the heart of what we do. This way of using the Lickety Playcards allows us to consult our Lickety Champion children about what makes the best play and is a rich environment for ideas and imagination to flourish. The great thing about these games is that you never get bored of them as you can keep adding new ideas and characters to them, invent new scenarios and imagine new places. You can go anywhere you want with them! 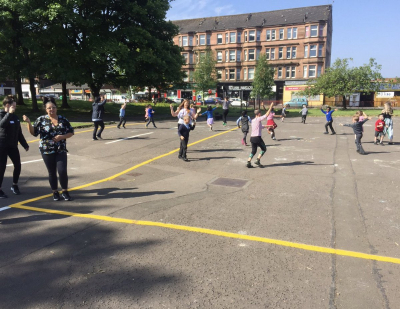 Playground Play is part of Storyplay Schools– Licketyspit’s drama-led play programme to help schools raise attainment by creating a culture of shared stories and play for the whole school community.